There’s a man at my church who is the only person I’ve ever met with at least as many food sensitivities as I have. He can’t eat dairy, gluten, or soy, so most of what shows up at the monthly church potluck is out for him. Since I know all too well what it’s like to go somewhere and not be able to eat, I’ve taken to trying to bring something that’s free of everything he’s allergic to. Sometimes it takes a little doing and sometimes, like with this potato salad, things come together in a snap. You can use any kind of potatoes you want…russet, white, red, even blue. Leaving the skins on gives it extra color, along with chopped colored bell peppers and bits of fresh dill. If 1/4 cup of oil seems like a lot, remember this is for a potluck and serves 8! I’m an oil-phobe and thought 1/4 cup was just right for the amount of salad. 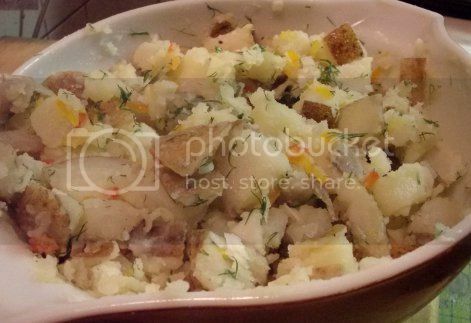 1) Cook the potatoes in plenty of boiling water until tender, about 15 minutes. Drain and transfer to a large bowl. 2) Add the onion and bell pepper, toss well. Chill until cold. 3) In a small bowl, mix together the oil, lemon juice, dill, salt, and pepper. Pour over the chilled potatoes and toss well to coat, breaking up any clumps of dill that stick together. Add more salt and pepper if desired. 4) Cover and chill until ready to serve. 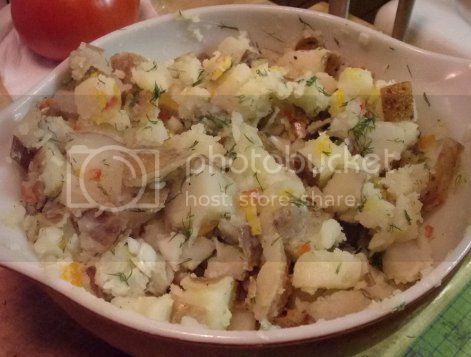 I got the idea of combining dill and lemon in potato salad from the Happy Herbivore cookbook. 🙂 It went over REALLY well at today’s potluck…only a tiny scoop was left!